At the laundromat today, I was reading _Japanese Photobooks of the 1960’s and 70’s_, and I came across this delightful passage from the manifesto of _Provoke_, an influential publication of the time. >The image by itself is not a thought. It cannot possess a wholeness like that of a concept. Neither is it an interchangeable code like a language. Yet its irreversible materiality—the reality that is cut out by the camera—constitutes the opposite side of language, and for this reason at times it stimulates the world of language and concepts. When this happens, language transcends its fixed and conceptualized self, transforming into a new language, and therefore a new thought. I found this notion quite striking. I’m sure it appeals to me in no small part because I find it so hard to combine photography and written language. Writing about photography is incredibly difficult for me. Writing around photography is easy. We do this all the time by taking up peripheral topics like equipment, technique, biography, and social commentary. All of which is very useful if your interest is in being able to make small talk while looking at a photograph, but not necessarily so useful if you want to actually say something about the photograph. Another popular approach is, of course, to fall back on artspeak, which I don’t do a lot of mainly because I don’t really know artspeak. I’m sure if I was fluent in artspeak, I would make regular recourse to it. Of course, it’s really mostly still talking around photography, but on the plane of abstract concepts rather than the plane of physical facts and realities. These concepts give us handles by which to manipulate the photograph and make it give up its secrets. Or, rather, they appear to do so. Of course, there are also photographs which can be truly and exhaustively understood with recourse to mere ideas, just as there are photographs which can be truly and exhaustively understood with recourse to mere technical details. But both types are essentially worthless, except insofar as they can be sold for money. All of which is just to say, I am used to thinking of language as inadequate for describing and understanding photography. But that _Provoke_ manifesto–I’m not sure that I had ever thought of the photographic image as being or becoming the _enemy_ of language. It is immensely appealing in the way that anything which explains away an incapacity is appealing. And it is, in a peculiar way, rather optimistic, presuming the authors were serious about the prospect of a new language and a new thought emerging. > Beauty captivates the flesh in order to obtain permission to pass right to the soul. This is the second in a series of short reviews of photography books. See the first, along with disclaimer, here. There’s a great deal to the photography — far more than I can speak to with my more or less nonexistent grasp of art history. As someone who has handled a camera, however, it’s not hard to divine from his work how skilled, committed, and attentive Bresson must have been. I was, of course, aware of the concept of the “decisive moment,” but I think I had understood this merely as a matter of good timing. But it is not (or at least not just) a matter of capturing the right instant in a series of instants for a moving subject. It’s more a matter of a truly impeccable sense of composition (coordinating the relationships of landscape, architectural, human, and symbolic elements) being extended to include time as well as spatial positioning and relationships. I’m not sure how much farther I want to go in describing the photography. If you’ve looked at Bresson’s photography, I’m sure you already know, and if you haven’t, there really isn’t a substitute for doing so. 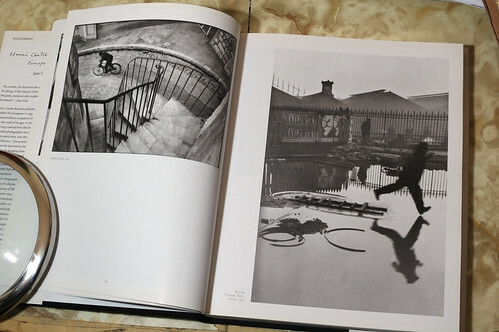 At some point, I would like to try to articulate more of what I’m seeing, particularly in comparison to Doisneau, and particularly regarding their senses of humor. It seems to me that there is a great deal of human comedy in Doisneau, whereas in Bresson, there is often a sort of sublime, absurd, and inhuman humor arising from the juxtaposition of elements which is only observable from the very specific place and time which are chosen; with Doisneau, there are moments which are familiar and which you feel you might share with Doisneau, or anyone else, if you happened to be in the vicinity. 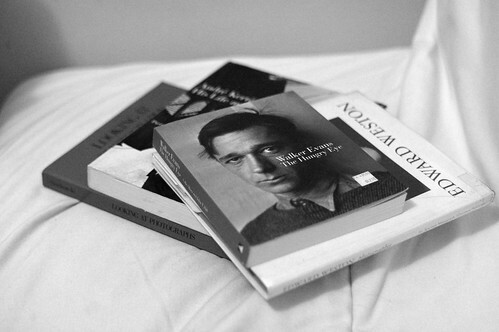 With Bresson, there is often the feeling that only by being Bresson and standing in his precise position could you have fully participated in the joke, and thus his images give more of a sense of looking through his particular eyes. This makes it sound like I think there is more to Bresson than to Doisneau; I don’t know that that’s really the case, however. 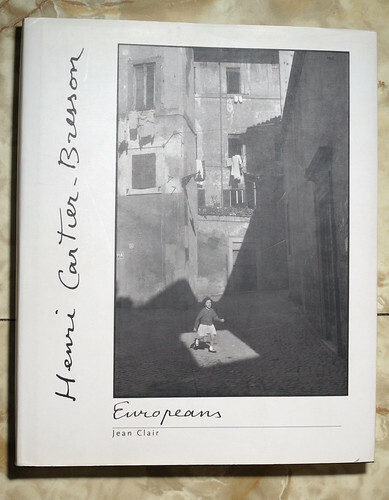 The only complaint I have with the book is the text by Jean Clair. As mentioned, I do not have any background in art history, and I don’t suppose I’m qualified to judge the text. On the other hand, I can’t help thinking that if I can keep up with Foucault and Nāgārjuna and at least fake it with a smile when confronted with Zizek, then the horror I feel at reading Clair’s prose can’t just be a question of it being over my head. What is it that speaks to us in a European landscape if not this invitation to walk across it, the thrill of crossing it, of penetrating it on foot, so unlike those landscapes of India or America which you can barely traverse with your eye and seem eternally elusive? Did [Proust] not also say genius…that its owner has the power to turn his personality into a mirror, ‘genius consisting in reflecting power and not in the intrinsic quality of the scene reflected’? An axiom which a follower of the Tao would not deny, for so strongly does the writer insist here, not on the brilliance of an intelligence, the grandeur of a culture or the worldly quality of a mind…but, to the contrary, on this somewhat passive power, on this ability of the body to reflect — unhindered by refraction — the image of life passing by. And while I may know next to nothing about art, I feel comfortable guessing that Clair knows even less about Taoism. Surely someday we will reach the point past which westerners no longer feel comfortable pointing to any particular quality/idea/sense/brainfart that strikes their fancy and dub it “Tao” or “Zen”? Also: “Unhindered by refraction”? Please. This is why people hate the French. Note: This is a translation, so some of the douchiness might be the fault of the translator. However, I doubt it; the majority of the douche factor here is coming from the content rather than the particular arrangement of phrases. I picked up the book on a whim while I was browsing at Moe’s today. I suppose my attention was caught by the small, squarish form factor — this is also true, by the way, of one of my favorite works of fiction, Kay Boyle’s novella The Crazy Hunter . When I opened it, I found to my amusement that the images contained within are scale reproductions of contact prints. This is an awesome idea. 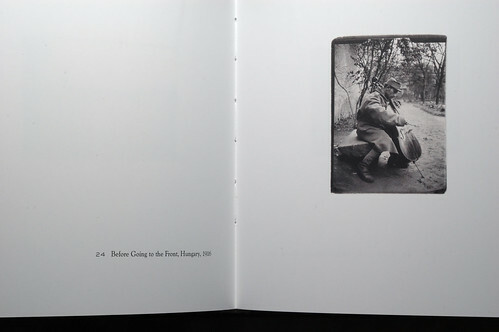 The usual paradigm for photographic reproductions is that bigger is better, and this has certainly led to some aggressively sized photobooks. These usually wind up sitting on my floor, because they don’t fit comfortably onto my shelves. 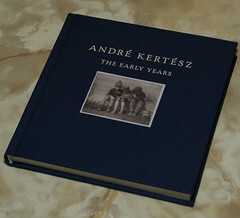 Many of the ealry photographs are simply of family gatherings on the porch or out in the countryside, yet within this period André also created a number of images that would later be considered among his masterpieces. But before I can reach a final verdict, I’ll need to go over it closely a few more times, and perhaps do a bit more “endless staring.” I’ll post an update if appropriate. By the way, miniature reproductions of photographs seem potentially quite relevant to contemporary popular photography, since so much of the photography we see online is presented via flickr or similar sites, and appears in thumbnail or near-thumbnail size….